Celebrate with mascot characters like Mickey Mouse, Elmo, Fortnite, Power Rangers, Baby Sharks, PJ Masks, Paw Paw Patrols or Star Wars characters getting them ready with Jedi training before they get into their spaceship Millennium Falcon to battle Darth Vader and Storm Troopers. A parent is more than a provider for their children, Iron man is more than a suit, Hulk is more than a temper, Captain America is more than a shield, Black Panther he is more than a king, Thor is more than a God, Spider man is more than a kid, Star Lord is more than an outlaw, Dr. Strange is more than a doctor, Batman is more than the Black Knight, Wonder woman is more than a warrior, Loki is more than a trickster type. The common denominator of all of the above – they are all HEROS. One of the most valuable aspects of planning your daughter’s birthday party is the decision of what Princess she loves. Is it the tale of the strong sisterhood between princess Elsa and Anna or is it the captivating story of princess Belle and the Beast. More than 500 costumes to choose from if you don’t see it just ask! Would you like to give your kids a birthday party that he or she will never forget? Wouldn’t it be wonderful if all the parents of the children at your son or daughter’s birthday party were talking about the event that you made happen? 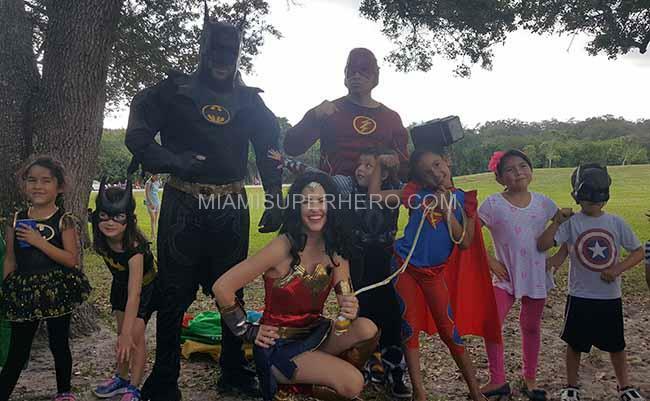 Be the actual Miami Superhero of the day and bring your kid’s favorite Superhero or Princess to your kid’s birthday party. Whether it’s one of the Ninja Turtles, Princess Sofia the First, a superhero, the entire Avengers team, or even a Princess for the little girl of your life, you can make your child’s special day unforgettable by hiring one of our incredible performers to show up as a superhero or other party character. For most kids, toys come and go. Birthday presents get broken, replaced, and discarded as soon as the next toy goes on sale. But memories of their superhero or princess party will last forever. Your little boy or girl will never forget the time their favorite character or superhero showed up to wish them happy birthday. 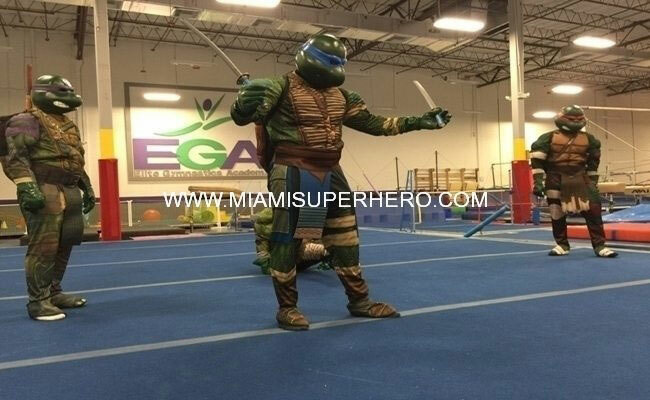 But with a Miami SuperHero it isn’t just a greeting. 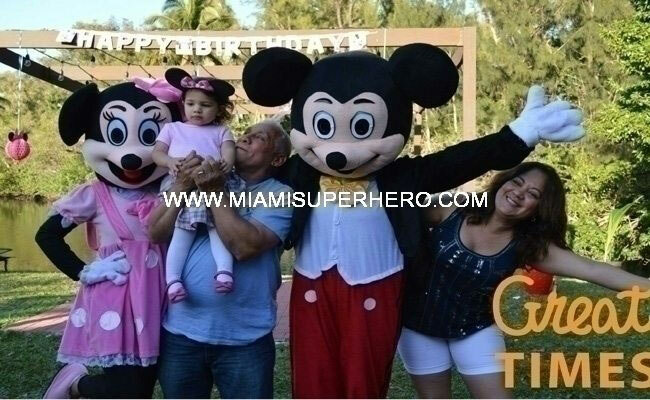 By using our service your kid will get to spend the entire party with their favorite Princess character or Miami Superhero, and the hero will even take part in a wide variety of activities to make sure memories are made that will last a lifetime. 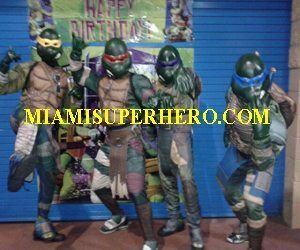 If you’re planning on having a character superhero party in Miami or the surrounding areas, your party will be covered by some of the best actors you’ve ever seen. Just check out our many customer reviews to see some of the incredible experiences our customers have had. Even better, check out the live videos on our YouTube page or other social media channels to see our performers in action! What Happens At Your Superhero Party? 1. Arriving with an amazing energetic intro, the Superhero or Princess you choose for the birthday party will get the day set for a lot of fun. Once all of the kids have gotten over the initial excitement of the superhero showing up (at least a little bit; they’ll be far too excited to completely calm down), the superhero will do a big parade to get all of the kids up and interacting with their favorite hero. They will play games with the kids based on their age and abilities; like musical chairs, hot potato, freeze dance contests, tug of war, etc. They can even show the kids some superhero kicks and punches. Our performers are specifically chosen to fit the role and look of your chosen superhero, princess, or other party character. 2. When it’s time to sing Happy Birthday, the hero will join in on sing-alongs with the birthday boy or girl, and also be there to help cut the cake. If there is a piñata (after all, what birthday party is complete without one?) the superhero will also help break it open. 3. Can you imagine just how excited your child would be if a Teenage Mutant Ninja Turtle sliced the piñata open, or if a Princess read them a story? The smile on their face would last until their next birthday and you’ll be able to capture it! All of the superheroes will stay around to take tons of pictures with all of the kids so every memory is captured forever. We even offer a photographer that will take pictures at your kid’s party and charge only per picture of your liking. 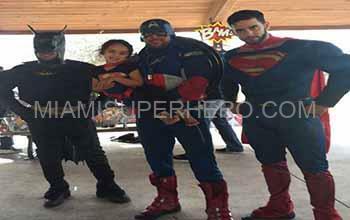 We arrange any Avengers or DC Superhero party ! 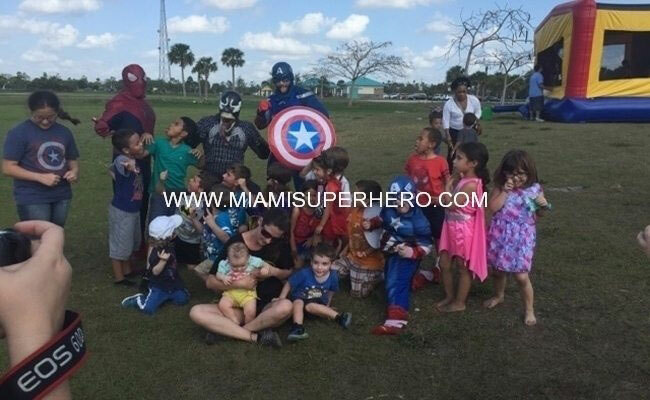 First we have the Miami Superhero introduction where the Superhero of choice makes a spectacular energetic arrival, from there he takes pictures with friends and family. Second, the Miami Character visit includes a fantastic kids party parade which includes the character playing with the children. 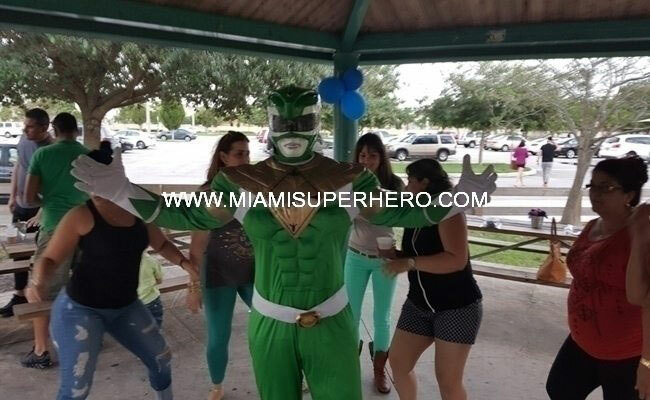 Then the superhero in Miami gets involved with the birthday cake and song. From there on the Superhero is all yours to improv in whatever you would like. Overall the children have a fantastic time and great pictures to look back at. 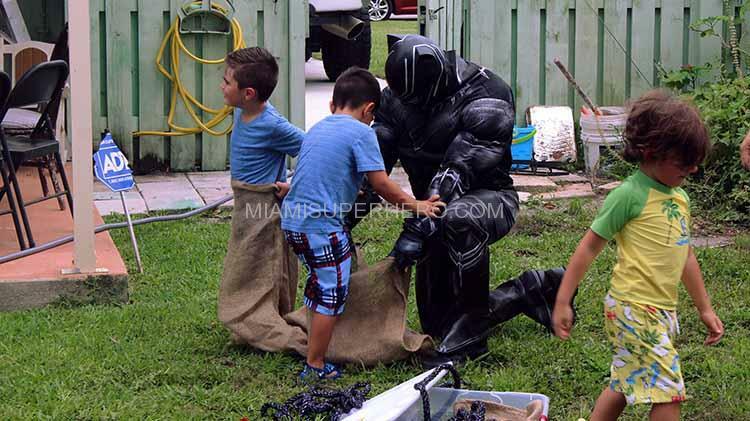 Kids are very much fascinated about their birthday parties and what could be better than organizing a party in one of the finest locations of Miami. There are lots of beautiful places which are apt for kid’s birthday parties and their friends will enjoy a lot. Hosting a unique party in Miami is not at all difficult with a number of beautiful locations and venues available to suit your needs. 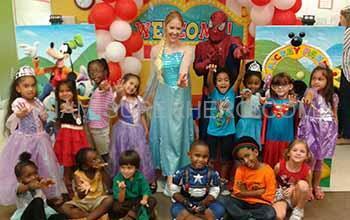 But nowadays the trend of organizing birthday parties with superheroes, Mickey mouse, Santa etc is popular. 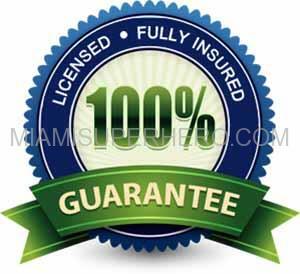 They are very much loved by the kids and that is why they eagerly wait for their birthdays. We ensure customer satisfaction with our party characters and we send you our most experienced and professional characters that are not only great with kids, built very well, very athletic, they are also great with adults!